The Friends of Tuggeranong Hill welcome new volunteers to join their ParkCare group who meets on Sunday mornings at 9am (dates below). The time and dates of their work parties varies, so please check out the Facebook page for the most up to date information. The Friends of Tuggeranong Hill group has started up again this year after a hiatus of several years.. After a suggestion by Southern ACT Catchment Group, we decided to try again this year, and with the assistance of Martine and Fiona at SACTCG we launched the new group in March of 2018. A big thank you to them both. We have since moved over to become part of Parks and Conservation, and doubtless that partnership will be equally productive. Early on we decided to opt for sustainability and keep the activities and organisation thereof reasonably simple, given the busy lives everyone leads. 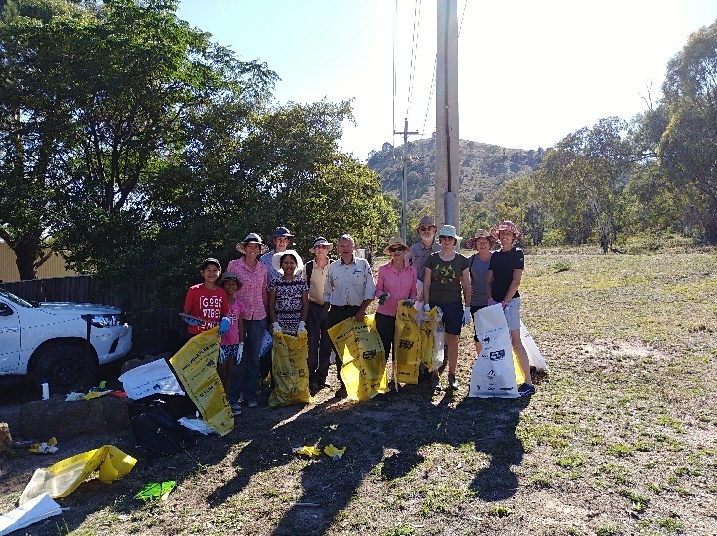 We kicked off in March with Clean Up Australia Day (photo attached), and have gone on to successful monthly meetings since. Like many groups, our main activity is weeding. Tuggeranong Hill is well endowed with a range of weeds, so we never feel short of work. The main weeds we have targeted are serrated tussock, thankfully reasonably sparse, garden escapees such as African daisy and euphorbia, and various woody weeds such as privet, rosehip and hawthorn. Tuggeranong Hill is a special place, with high biodiversity of plants and animals as well as unique cultural values. There is a Vegwatch site in eastern Theodore which we monitored this year for the second time with the help of Environmentalist of the Year, grassland ecologist Sarah Sharp. This was a great opportunity for the group to learn more about the plants in our patch; big thanks to Sarah for giving us her time. We also conducted a bird survey in October led by Canberra Ornithologists Group. 39 species of birds were detected over the course of the morning. Once again, how lucky we are to have such a group of expert and dedicated volunteers in the ACT who support environmental activities. One of the best things about our new group are the lovely people who come along. There are some regulars, and there are some people who can just come along now and then, and either is completely fine. We welcome anyone with an interest in the area.